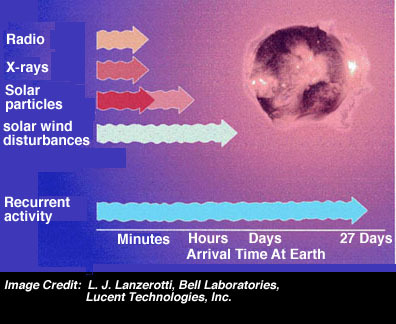 After a flare or coronal mass ejection erupts from the Sun's surface, major disturbances arrive with a range of time delays and a storm begins to build in the space surrounding the Earth. The disturbed solar wind collides with the Earth's magnetic field at only 1/6 of the distance to the moon. Each of the various disturbances that hit the Earth are associated with particular disruptions of our near-Earth environment. However, not every coronal mass ejection or flare produces a storm. Click on the elements below for details.